FAQ: Why No Online Ordering? | Happy Up Inc.
FAQ: Why No Online Ordering? Our Most Frequently Asked Question Answered! The cost of running an eCommerce site doesn't make sense for us. We tried having an online store for several years. It never reached the point where it paid for itself. Everything we put effort towards needs to support our overall goal of being a financially healthy and fabulous toy store. Everything we invest time and money in must (eventually) be able to pay its portion of the rent. Our online store was a constant drain on our resources and wasn’t sustainable. 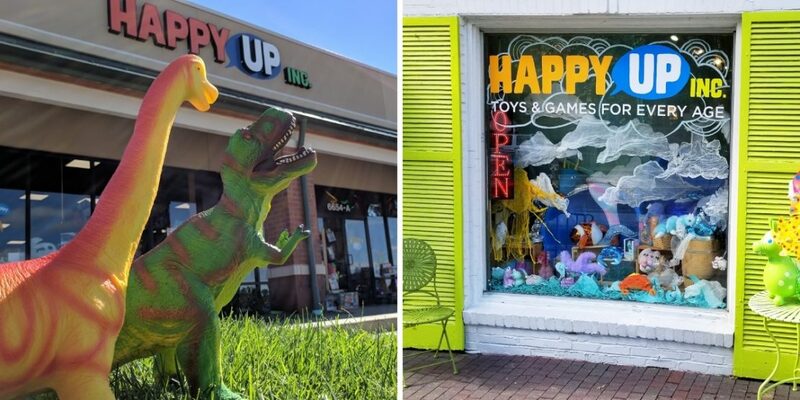 Because our main focus is, and always will be, on our bricks and mortar locations, our website needs to portray what it’s like to walk into a Happy Up store. Our website needs to be full of personality, easy to navigate, and offer information about the stores, our events, and the items we have on our shelves. It should invite you to come visit, and an eCommerce site typically doesn’t do that. With the Oct. 2018 update of of our website, we are able to showcase a selection of our toys, games, puzzles, art kits, science sets, baby gear, stuffed animals, outdoor toys, etc. etc. in a format that is actually helpful to visitors. And what we put on the website will always be a small fraction of what we have in stock. So come by for a visit and get the full Happy Up Experience!